Just as with children, a hot car can be deadly for our furry friends. At The Tapella & Eberspacher Law Firm, we view our pets as family members, and we want to treat them as such. In a hot car, an animal can sustain brain damage or even die from heat stroke in as little as 15 minutes. While small or elderly animals with flatter faces are most susceptible to overheating, even the healthiest pets can suffer from heat stroke, dehydration, or sunburn during the summer months. If your furry friend is panting excessively, seems to have difficulty breathing, an increased heart rate, drooling, or weakness, you must take action immediately. If they have a seizure, bloody diarrhea, or vomiting, you should take them to a vet right away. In Illinois, it is illegal to confine any animal in a motor vehicle in such a manner that places it in a life or health threatening situation by exposure to a prolonged period of extreme heat or cold, without proper ventilation or other protection from such heat or cold. Heat stroke isn't the only safety risk when pets are left alone in vehicles. An unrestrained animal can be a distraction to a driver, which can lead to a crash that could injure both human and animal. A leash is not always a safe alternative, as one pet owner learned when his dog nearly hanged himself by jumping out of an open car window. 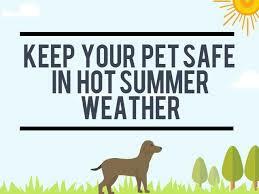 This summer, keep your pets cool and safe by following these Healthy Pet guidelines!